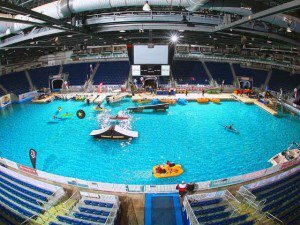 There’s no better way to ring in the New Year and open the boating season than attending the Toronto Boat Show at the Enercare Centre, Exhibition Place – Jan 12-21. The show no longer uses the catch phrase – “Put some summer in your winter at the Toronto Boat Show” but this January this is where to start planning your summer on the water. To get the inside-track on ticket discounts, special offers and to stay up-to-date On All Things Boat Show sign up to be part of the The Captain’s Club. Treat yourself this year to a special VIP Boat Show Experience with tickets starting at $35. See the entire show with no crowds. Enjoy the live music, adult beverages and get your bid in on a new Sea Ray SPX 190 in the live auction. There are lots of other items up for grabs in the live auction and be sure to visit the silent auction in support of Children’s Charities. The ticket price includes FREE PARKING in the underground lot. Where else can you find free, all-day seminars and workshops, receive non-partisan boat buying tips from industry experts, enjoy the Discover Boating Centre for new boaters, get Fishing Tips from pros, and even try your hand at wakeboarding on the worlds largest indoor lake? Get your pleasure craft operators card, experience virtual reality boating or find a career in the boating industry. It’s all here and it’s FREE. We all know the boat show is the best place in North America to see boats. If you already have a boat then perhaps new gadgets, products and electronics are what you are looking for. Here are a few unique items making their debut at this year’s show. People who live in glass houses shouldn’t throw stones but they should check out a brand new kayak that is almost invisible. The Crystal Kayak Company will be at booth E448. Mercury is bringing the world’s first outboard with the option of left or right handed controls as well as a reversible throttle. This will be in the main hall at booth 801. Yet another cool innovation from Mercury for the inboard boat owner. Now you can have joystick control on your wake boat so a novice can maneuver and dock like a seasoned pro. If you’re tired of putting out fenders (and you don’t have joystick control) this 9 foot PVC fender will be your new buddy. Check it out at Transat Marine booth G-417. There is information about careers in boating, paddle boats, wakeboarding dudes and dudettes, and even Twiggy the water-skiing squirrel. Kids 16 and under are admitted FREE when accompanied by an adult. 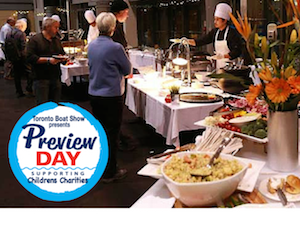 For more information about the biggest indoor show in North America, Seminar speakers and schedules, Group Discounts, Two-day passes , social media links, online tickets, Preview Day, Discover Boating, and FREE Weekday Parking after 4PM visit TorontoBoatShow.com. The Best Place to Buy a Boat & Boating Accessories is also the best place to find boat insurance. Be Sure to visit the Skippers’ Plan Team at booth # 1753 in the main hall.